It is the weekend I met my cute husband. It’s the beginning of the all things fun and great. I always liked lobster. But, now that my childen are into Lobster Bakes I have a whole new appreciation for this crustacean. It’s become a summer tradition for us and the kids take part in all the steps–from buying the lobsters to selecting their favorite parts to eat (J loves the knuckles and also littlenecks; M loves the claws and chourico; I love the claws; my husband likes the tail the best). 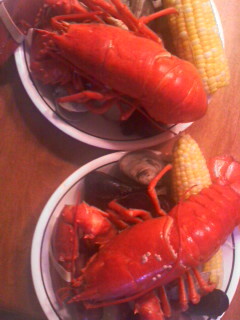 I feel very thankful that I can share these experiences with M and J, melted butter and all. This entry was posted on Saturday, May 29th, 2010 at 8:58 pm	and is filed under Blog Posts. You can follow any responses to this entry through the RSS 2.0 feed. You can leave a response, or trackback from your own site.